Dragon’s Kiss Cocktail came about one Friday night when I stopped by the grocery store on my way home from work. Brain-dead and ready for the long weekend, my stomach was grumbling like a caged beast. What usually happens in situations like this one is that I push the shopping cart up and down every aisle (I do not like missing anything), snatching this and that off the shelves, loading up on all sorts of fruits, vegetables, herbs, with the intention to make stuffed cabbage, Mom’s herb stew, schnitzel, fish tacos, quesadillas with homemade mole sauce. Aren’t you impressed? So, am I. By the time I get to my favourite cashier, the shopping cart is packed with all sorts of things and I have completely forgotten the main reason I was there in the first place (usually just milk). While pounding meat to a thin sheet for schnitzel is cheap therapy after a long day in the office, when I get home, there is barely enough motivation left to put the food away, let alone cook something from scratch like a full-blooded Mexican grandma would. Not this time. I had my act together. It was probably the cheapest trip in the history of Coco Supermarket Raids, mainly because I was not hungry for a change. And I remembered the milk. But I also came home with dragonfruit. Shawn gave me the old “You keep buying these exotic things and just let them rot in the fridge.” I said nothing, just cast a squinty-eyed look his way. While I have not figured out what to do with the two paddles of cactus from a previous trip to the store, I knew exactly what to do with this dragonfruit. Well, I had an idea. Dragonfruit looks unreal with an electric pink peel, alien egg shape and dotty interior. I love dots. This was the first time I had noticed it in the produce section. I had to see what this odd little fruit is all about. Luckily, I practiced some self-restraint and bought only 2. The Old Colette would have picked up as many as she could hold in her arms. Now that I had it, what was I going to do with it? The inside was soft, almost like a pudding with an unexpectedly mild taste, something close to a pear. Apparently, most people just slice it in half, scoop the flesh out with a spoon and eat it. That’s it? How boring. Something with such wild looks deserves a proper place on the menu, like a dazzling show-stopping cocktail. And, as luck would have it, the good folks at Cocozia had sent me a box of their delicious organic coconut water. I just could not convince myself to do anything but whip up a batch of tropical potion with a naturally vibrant green color. 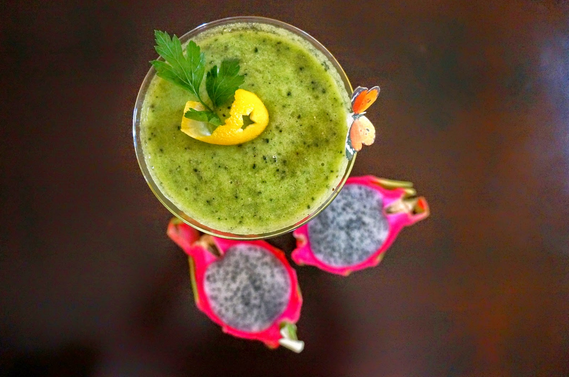 Dragon’s Kiss is a refreshing and nutritious drink that anyone can enjoy. Just nix the booze so the kiddies can raise a glass, too. Use a vegetable peeler to take 4 ribbons of zest off of a lemon. Punch/cut a little star pattern out of each zest ribbon. Peel and cut apples into large chunks. Toss into pitcher of a blender. Add remaining lemon zest and squeeze juice over the apples. Cut dragonfruit in half and scoop the polka-dot pulp out. Add herbs, coconut water, ice sugar and Amaretto (if using). Blend smooth, fill glasses and decorate with a pretty edible butterfly! Using coconut water in any drink is a lovely substitute to ordinary water. Sugary store-bought cocktail mixes have no place in my kitchen. The Dragon’s Kiss is so easy to make from scratch using the freshest fruit and herbs with a hint of coconut flavour. This isn’t the stuff that comes in a can. Coconut water is extracted from young fruit. So it is light and mild in flavour. Cocozia tastes so fresh you’d think someone just climbed a coconut tree, grabbed a coconut and stuck a straw into it. Get ready for the hot summer with a vibrant drink that is sure to keep you as cool as a tropical breeze. *This is not a paid post. 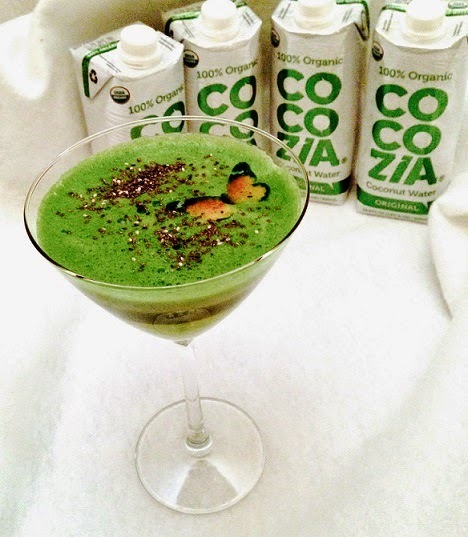 I was given a sample of Cocozia coconut water to review. All opinions are my own. Coming from Singapore, I love dragonfruit… and I like your amazing way of transforming this yummy fruit to this refreshing and nutritious drink… No more brain dead??? Cheers! What a beautiful cocktail! Colette, what a beautiful photograph of you and your lovely daughter you added to your blog – just wonderful, dear friend! I was also delighted to read the fabulous news about your health on fb – I wish you all the strength and all the very best there is on the continued road to health!!! And not to forget your drink, it looks extra special, extra delicious – I have never prepared anything with dragonfruits, I have only enjoyed them raw, as is. What surreal looking fruit! I'm going to have to look for it in the specialty grocery stores! I love your descriptions of your shopping trips! I'm the same way too when it comes to my fridge and rotting food! But at least you cook and bake amazing dishes!! What a fun cocktail! I hope Daisy enjoyed it!! (the amaretto-free version?) I have seen dragon fruits only when in California. I hope they come to Tucson, soon! Cocozia cocoanut water? I can’t wait to try this ❤️? ?